The search for the best plastic surgeon can feel overwhelming. There are, however, ways that you can narrow down your decision to only include the top plastic surgeons in Sydney and to avoid sub-par surgeons. First, find plastic surgeons who are Fellows of the Royal Australasian College of Surgeons and the Australian Society of Plastic Surgeons. This will ensure that they have they specialize in the field of cosmetic surgeon and adhere to a strong code of ethics. If you are considering rhinoplasty (nose job surgery), you can narrow down your list further by choosing a clinic that includes both a plastic surgeon and an ENT- ear, nose and throat – specialist on board. Even if your sole purpose is cosmetic surgery for aesthetic reasons, the expertise of an ENT specialist will decrease the risk factors associated with this type of surgery. Finally, once you have narrowed down your choices, it’s time to schedule consultations. During your consultation and preoperative analysis with a Sydney plastic surgeon, do not be reserved about asking any questions that you may have. Take this opportunity to ask questions about the physician’s experience, about risk factors, how much the procedure will cost, and anything else that is of concern to you. This is also a good time to ask for cosmetic surgery before and after pictures. Your physician should offer photos of previous patients so that you can get a clear idea of what possibilities are available. In addition to asking about the surgeon’s experience with the type of cosmetic procedure you are seeking, be aware of the physician’s bedside manner. If they are at all pushy about procedures and do not allow you to make the decision for yourself, seek services elsewhere. The decision should be entirely up to you, and you should be given all of the information you ask for while being allowed the time necessary to make an informed decision. 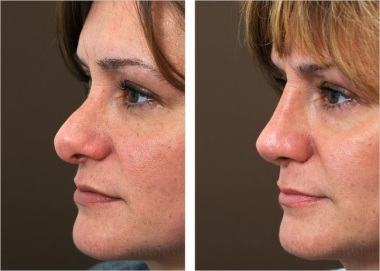 Rhinoplasty, or nose job surgery, can dramatically change the overall look of a person’s face. This is most likely the reason why this form of plastic cosmetic surgery has become so popular in recent decades. Small changes in the structure of the nose can make a big difference while at the same time ensuring that the final outcome creates a natural look that fits in with the rest of the face. If there are any flaws in the structure of your nose that you would like fixed, it is important to search for the best rhinoplasty in Sydney. While the results of modern nose job surgery are better than ever, the decision to get this procedure should not be taken lightly. Surgeries of any kind can present various risk factors. To minimize these risks, find the best option for top rhinoplasty in Sydney. You will then be able to feel confident that the outcome you are looking for will be achieved and that post-operative recovery will be relatively quick. Plastic surgery has become more common than ever before as major advancements have been made in this area of medicine. Each year, millions of people undergo cosmetic surgery for one reason or another. The plastic surgeons of today are able to more effectively create a natural, aesthetically pleasing look depending on the area of the body the patient would like to improve. Many people opt for surgeries such as rhinoplasty (nose surgery), breast enhancement or reduction, or other types of plastic surgery in order to improve their self esteem. While these types of procedures are more common in women, a growing number of men are also undergoing plastic surgery procedures to improve certain physical features. In some cases, the changes are minor, while in others, major alterations can be made. Physical changes in the body are an inevitable outcome of the aging process. Many men and women opt for plastic surgery in order to restore their youthful features. In some cases, lifestyle habits such as smoking, excessive drinking, poor nutrition and lack of exercise bring about undesirable physical features that can be altered by a plastic surgeon. If you are unsure about your decision to undergo this form of surgery, it is important to talk with an experienced cosmetic surgeon. Bring along a list of questions or concerns that you may have about the procedure. A few things that you might choose to ask about include the risk factors, the overall cost, post-surgery recovery, and an overview of what the procedure involves. This will help you to make an informed decision. At the same time, a consultation with a professional will also help you to get an idea about whether or not you would like to use that particular doctor’s services. Undergoing cosmetic surgery is a big decision, and thoroughly exploring your options will allow you to feel confident about your decision. Rhinoplasty, better known as nose plastic surgery, is one of the most common types of plastic surgery procedures. When a nose job is done for cosmetic reasons, it is considered “elective.” In many cases, rhinoplasty is not elective, but is carried out for medical reasons. For instance, a person with significant breathing problems may benefit from this procedure. Depending on the nature of the procedure, the surgery may be performed under either general or local anaesthesia. When local anaesthesia is used, the nose and area around the nose are numbed, and the patient will be under a light sedation. During procedures using general anaesthesia, the patient remains is not awake at all during surgery. Individuals who undergo cosmetic nose surgery usually review nose job before and after photos to get an idea of the changes they will be able to make to their own features. Today’s rhinoplasty surgeons are able to increase or decrease nose size, narrow the nostrils, change the nasal bridge shape, change the shape of the tip of the nose, change the angle between the upper lip and nose, and much more depending on what a patient desires. Patients with breathing problems, a birth defect or injury that has affected their nasal passages, a deviated septum, or other related issues may benefit from nose surgery. For example, the nasal septum is the thin wall that separates your left and right nostril. If the septum is significantly off center, it will not allow proper air flow, which can lead to a number of health issues. A rhinoplasty surgeon will be able to assess whether or not deviated septum surgery will benefit patients with this problem. When considering any type of nose job surgery, whether for cosmetic or medical purposes, it is important to talk with a facial plastic surgeon who will be able to answer all of your questions and concerns. You know that your nose has an outside and an inside, and you probably also know that there are both cosmetic and corrective procedures available for the nose. The big question then is: do you know what each of these procedures do? Let’s take some time and find out all about the most common and beneficial procedures that affect the nose. When something is done to the outside of the nose it is often referred to as a “cosmetic” procedure or even technically as “rhinoplasty”. While cosmetic intentions are often the goals of these efforts, there are also some corrective things done too. For instance, someone who has badly broken their nose in the past may need to get some broken nose surgery done to repair the damage. Generally, rhinoplasty is going to be meant to enhance the looks of the nose. This is not something that is done according to a template or a set of standards. Why not? Every face has different proportions and this means that it takes a physician familiar with aesthetics to understand and succeed with any cosmetic work. This sort of physician is going to sit down with the patient long before the surgery is planned. They are going to develop a sort of “profile” of the individual in order to give a full and proper evaluation. Not only does this evaluation take the person’s age, ethnicity, and facial balance into consideration, but it will also look at the breathing fitness of the person. This means that good cosmetic work is also going to always consider the functionality of the nose before and after the work is completed. Will there be any improvement or impediment to the septum? Will there be any risk of swelling or irritation making breathing less efficient? What about past damage to the interior of the nose? If the physician finds any problems, they will alleviate them during the surgery. So, your surgeon can make sure your nose “fits” your face and improves your appearance, but they can also help you to alleviate any past respiratory problems that you experience in the nose. For instance, they can fix cartilage issues by performing septoplasy that removes excess tissue to straighten the central structure of the nose. They might also remove tissue from the nasal turbinates should they have grown too large to allow easy breathing. They might even perform endoscopic sinus surgery if polyps have grown out of proportion or if adenoids are chronically swollen too. The point is that any nasal procedures can be a combination of events. And it all begins when you consult with an experienced and knowledgeable expert. They will understand that people rarely want multiple procedures and they will ensure that you can get as much done during any specific surgery as possible. This can shorten recovery time and provide the patient with much easier and efficient respiration almost immediately. If you are dealing with sinus or breathing issues relating to the nose, and you also want to alter the appearance of your nose, a visit to a surgeon is a good idea. They are always going to keep your best interests as the objective and will be sure to guide you towards the procedures that will benefit your health. You don’t have to live with breathing trouble, and all of the associated health problems that can go along with it. Nor do you have to live with a nose that is out of balance with the rest of your features. There are surgeons who can give you an aesthetically pleasing nose, or help you get the fully functional nose you desire. Rhinoplasty surgery is usually performed under general anesthesia, depending on the exact procedure and the surgeon and patient’s preference. Rhinoplasty is performed in a hospital or an outpatient surgery center. Complex procedures may require an overnight hospital stay. The procedure usually takes around 2 – 3 hours, but may take longer. Rhinoplasty surgery is performed under a combination of general and local anaesthesia. You will not be aware through the procedure. The nose and the area around it is numbed with local anaesthesia. General anesthesia allows the patient to sleep through the operation. The surgery is usually done through a cut made inside the nostrils. In some cases, the cut may be made from outside, in the base of the nose. This type of cut is used to perform work on the tip of the nose, or if you need a cartilage graft. A small plaster may be placed on the outside of the nose. This helps maintain the new shape of the nasal bones when the surgery is finished. Soft silicone splints or nasal packs also may be placed in the nostrils to keep the dividing wall between the air passages (septum) stable. After surgery, small burst blood vessels may occasionally appear as tiny red spots on the skin’s surface. They are usually minor, but are not permanent. There are no visible scars if the rhinoplasty is performed from inside the nose. If the procedure narrows flared nostrils, there may be small scars at the base of the nose that are not usually visible. Rarely, a second procedure may be needed to fix a minor deformity. If you have questions about cosmetic nose surgery contact your local doctor who will arrange for you to see a nose surgeon. Many patients of rhinoplasty surgeons seek treatment because they believe that their nose is out of proportion with their face. Alterations such as increasing or decreasing the size of the nose can be accomplished by an experienced surgeon. The shape of the nose must also be considered, both for functional and aesthetic reasons. It is important that the nose fits in naturally with the patient’s face while ensuring that proper breathing is maintained.